Comments: Shown here with two different 1925 hairstyles, Katherine Elizabeth Pitts was born in 1907 at Belle Haven, her family's Scottsville home. She was the daughter of Captain John L. Pitts and Helen Amanda (Burgess) Pitts. Katherine attended Scottsville public schools and completed her undergraduate degree at Randolph Macon College in Lynchburg, Virginia. She also completed one year of graduate work in Berkeley, California, and taught school for many years in Scottsville. On April 6, 1929, Katherine married John Randolph Phillips, who was a fellow Scottsville High School graduate and a free-lance writer. In 1931, they became the parents of a daughter, named Kathleen Elizabeth Phillips, who, like her mother, was born at Belle Haven in Scottsville. This photograph is part of the Kathleen (Phillips) McNamara collection. 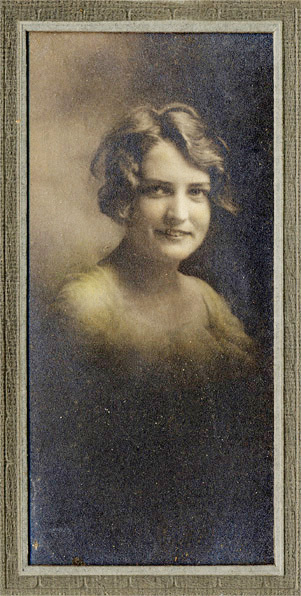 Kathleen resides in Scottsville and is the granddaughter of Captain John Lee Pitts and Helen Amanda (Burgess) Pitts.